The ZAD will not disappear. We live here, we are rooted in this piece of countryside, we will not leave. Cabin of the Vraies Rouges at the ZAD, which houses the English language library, threatened with destruction. via Zone A Défendre. This communiqué was first published at Zone A Défendre. Translated by David Broder. For many years the movement managed to keep them at bay, but there have now begun fresh attempts to evict the ZAD ["Area to be defended," on the site of a now-abandoned airport project] in Notre-Dame-Des-Landes. The operation set in motion in all its brutality on 3am on 9 April: interminable queues of navy-blue vans, the armoured cars, the tear gas, the first wounded and the first arrests. The gendarmes [armed police] announced that journalists were strictly forbidden "across the whole facility" and their access to the site was blocked. They made clear that the media were not allowed to take pictures and would have to settle for the ones provided by the gendarmerie itself. These evictions confirm the government’s pretence of re-establishing law and order even while crudely setting itself above the law. 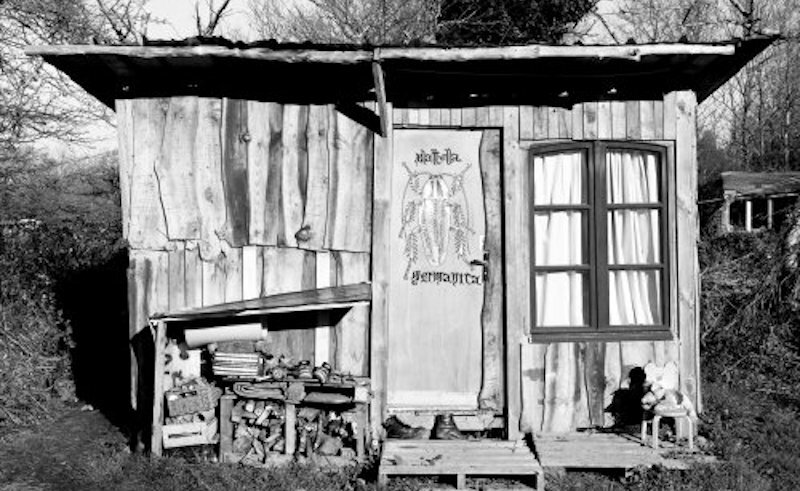 The police prefecture did not even condescend to allow the ZAD’s inhabitants access to minimal, basic housing rights, i.e. the contradictory, person-specific procedures that come into force in the event of an attempt at eviction. This, even though the inhabitants of most parts of the ZAD had indeed repeatedly given their names and identified themselves over the course of the last few years. The prefecture’s pathetic double game today stands out in all its hypocrisy: it proclaims itself on seeking a "calm and peaceful" way out of the situation, even as it sends 2,500 police to clear out the ZAD’s inhabitants. They tell us that there will be a "sorting process" to distinguish among the inhabitants, operating according to purely fictitious categories, which correspond to nothing other than the repressive storytelling that the government has set its store by. There are not, in fact, radicals on one side and farmers on the other, but a combined set of intermingling ways of sharing this territory. Contrary to what [interior minister] Gérard Collomb says, no one has individually sought to regulate their own situation at others’ expense in recent weeks. The whole movement has proposed the framework of a collective agreement for all the inhabitants and all the projects that are going on at the ZAD. But the government could not simply admit that the airport project was useless; it absolutely had to take revenge on those who had forced it to abandon it. The earth is dying, the most brutal economic forms make our lives wither away, and everywhere people aspire to break out of this state of affairs. There were 30,000 of them here on 10 February, committing to support the ZAD and its future. But the government’s political message this morning is very clear: there must be no room for spaces of experimentation. This morning we are deeply angry, faced with the lamentable waste represented by the authorities’ determined destruction of the homes and living spaces that we have built here. There are powerful emotions, faced with the idea that the police deployment will threaten the collective experience of the ZAD. But the ZAD will not disappear. We live here, we are rooted in this piece of countryside, we will not leave. We salute the courage of the people who have already joined us on-site and responded to our appeals. In 2012, the state’s crushing arrogance ended up rebounding against it. In a context of mounting strikes, demonstrations and occupations throughout the country, our judgement is that the eviction of Notre-Dame-des-Landes will become a new motor for the spreading revolt. This demolition operation will turn against its own authors. We call on all those who can join us, now or in the next few days, to come to the ZAD. More than 80 rallies are already planned for this evening [9 April] around France, including the ones at 6pm in Nantes and Rennes. The response to these evictions will also last a long time. A demonstration has been called for Nantes on Saturday, and there will be a gathering at the ZAD itself over the weekend.